Here’s a summer newsflash! Let’s agree to put the car keys away and not book those airline tickets. We can stay right here in Newport Beach and enjoy some of the best “resort” experiences one could dare to imagine. An impromptu stay-cation can be the perfect recipe for enjoying a carefree summer getaway with the family, or perhaps a romantic respite for just the two of you. 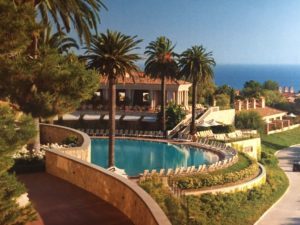 Here we have sleuthed our way around town to find hotels with newly renovated pools, resort games and outdoor patios for a nibble under the sun or stars. So let’s jump in and get our summer started! 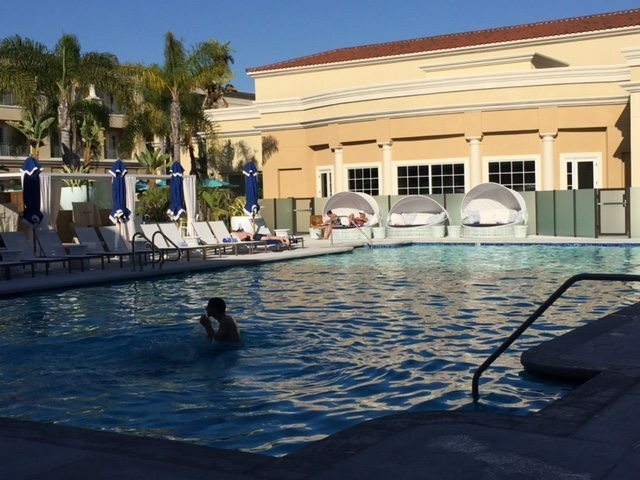 The Newport Beach Marriott Hotel & Spa at Fashion Island has not one, or two but three pools for their hotel guests. 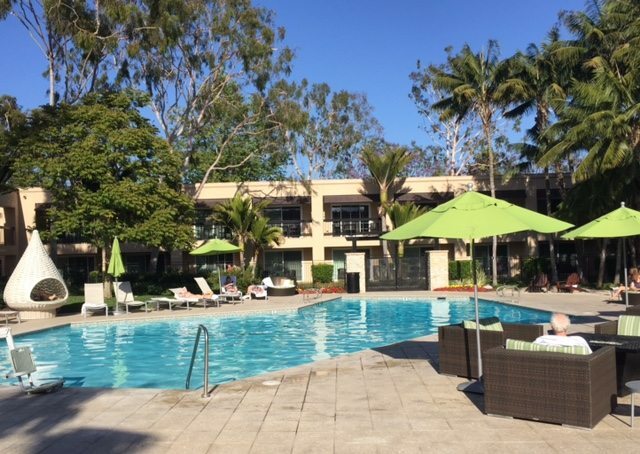 The main pool has just been completely redone with new lounge chairs, umbrellas, circular lounge beds, palm trees and a brand new bar (which will be installed in early July). From the pool there are peek-a-boo views of the golf course below. 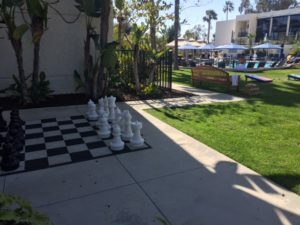 They also have a splash pad for children to run through, an oversized chess board and, on the lawn, families were tossing bean bags with a game of corn hole when I strolled past. Under the shade of a covered patio can also be found a pool table and table tennis. The new bar will be a nice addition and with blended cocktail names like Witch Doctor and Hemingway Special just reading the menu can be quite entertaining. 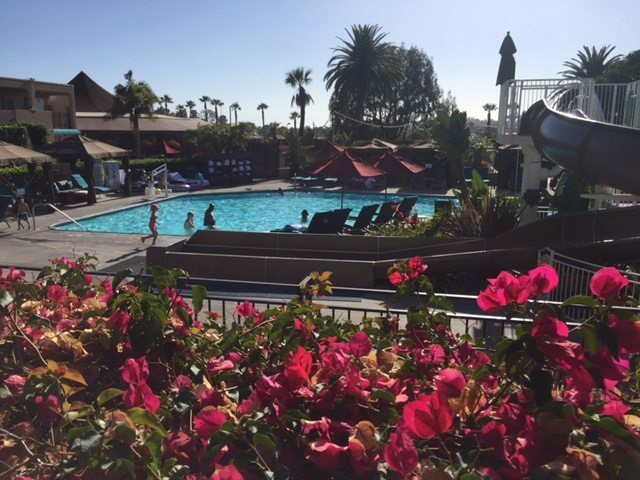 Starting the Fourth of July weekend there will be live music at the pool from 5:00-7:00pm on the weekends. Hotel guests can also order from a brief menu, including items such as: Lobster Salad, Hummus with Pita &Almonds, Cous Cous & Cucumber, Fish and Chips, Burgers and Club Sandwiches. On the south side of the hotel is a rather hidden pool for “adults only” called the Harbor Pool and this has views of the ocean. The pool is surrounded on three sides by guestrooms and is very relaxing indeed. The Spa Lap Pool is filled with sea water and has entirely new sitting areas and cabanas to luxuriate for that “water-inspired” experience at their Pure Blu Spa. Another recently renovated resort pool is found at The Balboa Bay Resort. This pool area is protected from the breeze of the bay and has just added new cabanas which resort guests can rent by the half or full day. There is also a covered cabana for pool side spa treatments and an elevated whirlpool for soaking in the bubbles. The Pool Menu is extensive and servers are available all day to take guest’s food and drink orders. There are starters, such as: Tortilla Chips, Salsa & Guacamole, Ahi Tuna Poke, Shrimp Cocktail and main entrees including: Kobe Burger, Quesadilla, Mahi Tacos, as well as Smoothies and Desserts. A full bar is available with numerous beers on tap. Don’t miss the outside deck at A&O Kitchen+Bar (Anchors & Oceans) which is their gastropub and lounge area. This is open to the public offering an impressive spot to bring out of town guests. The terrace firepits are a perfect spot to “press pause” when the sun sets— offering water views of the Marina. It is nothing shy of spectacular! 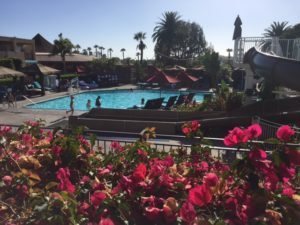 The Hyatt Regency Newport Beach on Jamboree sits on 26 acres and has three pools for their resort guests to enjoy. The Oasis Pool is ginormous in size and features a wrap-around water slide. This is a perfect spot for making summertime memories, or perhaps learning to swim? There are a plethora of lounge chairs, day beds, cabanas and a pool bar. The grounds are lush with tall palm trees, manicured greenery and lots of colorful flowers. Under the shade of trees toward the front of the resort, hotel guests can cozy up in the Adirondack chairs for a relaxing game of shuffle-board, a game of chess with an oversized board set on the lawn and there is even a 9-hole executive golf course on-site which is open to the public. (Ask about their night golf with glow-in-the- dark golf balls.) During the summer the resort hosts hula hoop contests, games such as a water balloon toss and even hula lessons. As the name implies, the Serenity Pool at the Hyatt Regency NB is tucked in a secluded corner of the resort for quiet relaxation. The lime green umbrellas always make me smile! The Indulge Pool is the third pool and is the perfect balance between the large family-oriented Oasis Pool and the calm of the Serenity Pool. The dining and cocktail offerings are presented on a cute surfboard shaped menu. And the choices are aplenty here at The Hyatt. There are thirteen starters and salads—from Caesar Salad to Asian Noodles, Greek Yogurt Parfait Cup and Chicken Fingers… just to name a few. For sandwiches and entrees the Roast Turkey Club Wrap is very popular, as are the burgers and grilled cheese. A full bar is available with lots of craft cocktails, wine and 8 choices of beer. 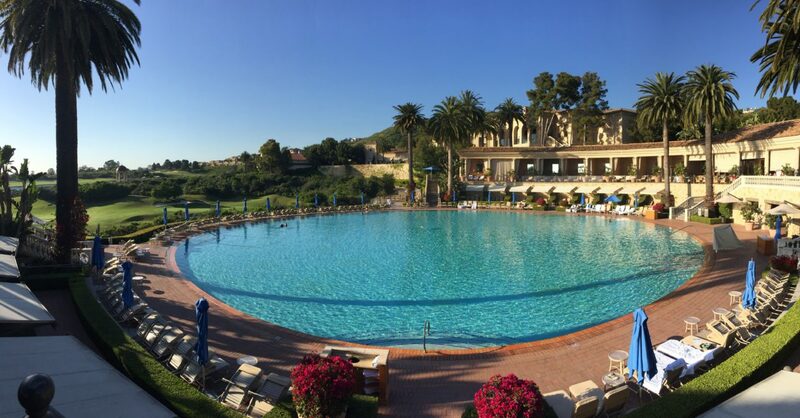 On a lovely summer day, the Coliseum Pool at The Resort at Pelican Hill is just magical. 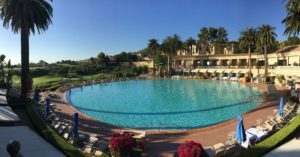 The expansive 136 foot circular pool is breathtaking as it cascades toward the lush green golf course below and the ocean beyond. There are 18 cabanas that are available for rent to resort guests, and 18 sheltered sitting areas for guests of the resort. Chaise lounges are all along the edge of the water and it looks so restful—a true oasis. The pool has its own Kitchen and Bar so items can be ordered quickly with a host of friendly servers. This is available from 11-5 and drinks are served until sunset each evening. 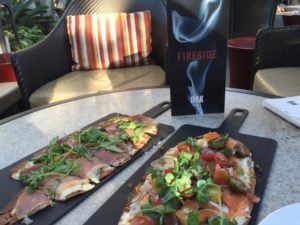 From tomato bruschetta, to ceviche, thin crust pizza, salads galore, sandwiches and entrees, and a nice menu selection for children—so there is something for everyone. The menu goes on for two pages, followed by two pages of drinks, wine and just about anything you can think of to order. It is the most extensive menu of all the poolside offerings. And for those who are not staying at the Resort, dining guests can still enjoy the view by dining upstairs at the Coliseum Grill. Dining is available on the terrace, the dining room, or at the bar with a big screen close by. Score! 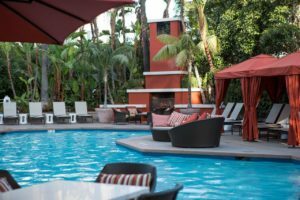 The Island Hotel’s elegant and newly redesigned pool area is lush with tropical greenery creating a sanctuary in the heart of Fashion Island. 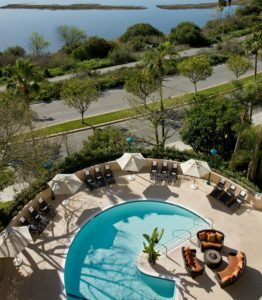 It features cozy shaded swivel lounge chairs, tables, chairs and private cabanas with a fireplace nestled into the foliage. 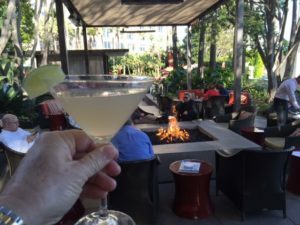 A full bar offers shaken craft cocktails, wine, beer and spirits such as signature margaritas with Don Julio Tequila, R&R Collins with Hendrick’s Gin and SoCal Sun with Bulleit Bourbon. Those in the know love a staycation at Island Hotel. Why? Pool guests are pampered with complimentary treats throughout the day such as frozen grapes and refreshing housemade fruit sorbet. The Newport Beach Cabana Package features one bottle of Veuve Clicquot, chilled scented towels, fresh fruit and bottled water ($200 for two hotel guests/day). Poolside guests can order delicious SoCal favorites such as Ahi Poke, Chips & Guacamole, Lobster Salad and a Classic Burger from Oak Grill. On Saturdays is an all-you-can-eat poolside BBQ, $24/adult and $15/children ages five to 12. If staying on a Friday night, ask about the fun poolside Dive-In Movies showcasing family flicks (complimentary and on select Friday nights). 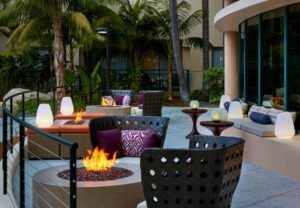 Adjacent to the pool area is the welcoming Fireside Terrace with a huge firepit and lots of comfortable seating. In the evenings (Wednesday through Saturdays) are live acoustic music from 6-9pm and a great Happy Hour from 3-7pm. Be sure to try my favorites: Heirloom Tomato and Mozzarella Thin Crust Pizza or Chicken Club Sandwich. During weekdays (from 11am-2pm) they roll out an Express Lunch cart with lovely pre-made sandwiches, chips and beverages for only $7! Guests can dine on the Fireside Terrace or grab and go! 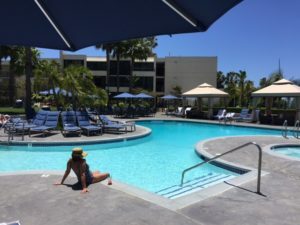 The Duke Hotel Newport Beach (part of the Marriott Family) offers an upscale California contemporary décor and their Palms Pool is not to be missed. 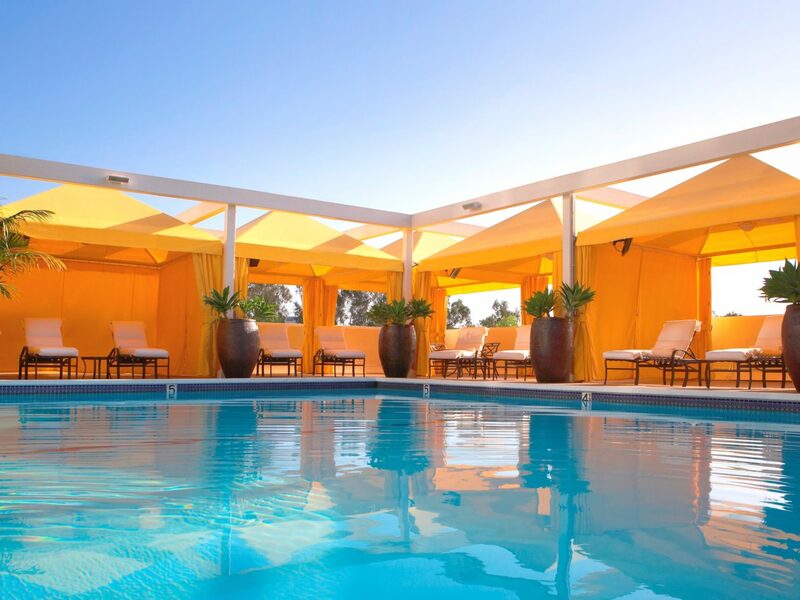 There are elegant cabanas draped with bright yellow canvas and palms are everywhere. Guests having a treatment at the Spa Sante are also able to enjoy the pool area. They have a special poolside menu serving guests on their lounge chair by the helpful pool servers. Service is available from 10:00am to 6:00pm, every day. Their menu is expansive—- including many specialty items delivered from the EVO Bar and Restaurant downstairs. They also have a complete selection of beverages from wine and champagne to sangria, lemonade, blended iced cocktails (made with natural juices) and of course, beer. And for the kids, a child-sized menu is also available poolside. 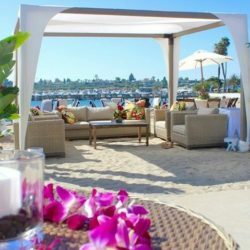 The Newport Beach Marriott Bayview enjoys a lovely outdoor space that is perfect for couples and families alike. They have fire pits and conversation areas galore, a large pool out in the sunshine and a nice covered area so little ones who tend to burn can catch a sheltered break and still be in the water. From the sitting area, guests have a perfect perch from which to view the Upper Newport Bay Nature Preserve. And if one looks carefully, you can see the water at high tide, perhaps kayaks gliding past, always lots of birdlife and a busy bike path as well. Dining for the pool area can be easily ordered through the wait staff from 11:00am to 10:00pm. Their restaurant, Vista.Kitchen.Bar provides all the dining and beverages for the pool area. Perusing the menu there are so many choices, including: Crispy Shrimp Tacos, Charcuterie Board, Ahi Nachos, four different gourmet Burgers, and my favorite, the Cobb Salad. They feature seasonal specialty cocktails made with locally grown fruits and herbs, have a nice wine selection by the bottle or the glass with various pours. They also feature 7 beers on tap and 15 bottled. 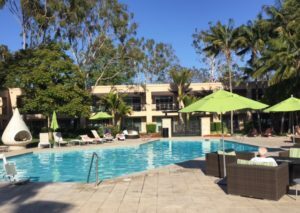 This is a primarily a business hotel, however what a pleasant surprise to open the door to the pool area at the Radisson Newport Beach. 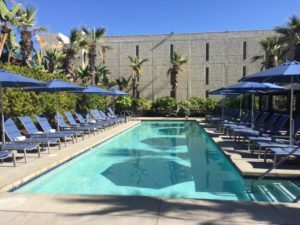 It is a large space with sprawling lounge chairs, umbrellas and palm trees meandering through the hardscape—offering shade and a gentle sway as the breeze kicks up in the afternoon. The pool cuisine arrives from the restaurant Tiffany’s Cuisine and features many of our SoCal favorites, as well as wine, beer and cocktails. The hotel has a menu board and a telephone right there at the pool. They have thought of everything! Guests are just steps away from ordering and it is promptly brought out to the pool area for guests to enjoy and luxuriate all at the same time!